In recent years, thousands of people prominently coming from Middle East, forced to leave their home countries and move to Europe in order to escape from the ongoing violence and conflicts in their region, and at the same time to protect themselves and their families. It is quite well known nowadays that this refugee crisis that Europe witnesses is considered to be the biggest refugee crisis after the World War II. According to migration literature, digital technologies are an essential tool for refugees not only to overcome numerous obstacles they might face during their resettlement, but also to maintain ties with their country of origin. In this context, this research explores refugees’ perceptions on digital privacy when using these technologies in the Netherlands. The censorship and the violations of personal privacy that these people have experienced or witnessed by the local authorities in their home states, raise questions regarding their present digital behaviour; how they use these technologies, if, and how, they manage to protect their personal privacy. Great attention was given by the academia to the relationship between the digital technologies and refugees in a more practical way. The current literature focuses on how new technologies facilitate refugees’ resettlement and integration into the host society. Less emphasis has been placed on refugees’ notions regarding their digital privacy when using them. Therefore, this thesis examines refugees’ perceptions and experiences through interviews referring to the digital privacy. A total amount of ten in-depth interviews were conducted with refugees who are currently residing in the Netherlands. The qualitative content analysis by in-depth face-to-face interviews was considered to be the most suitable method of answering the research question of this thesis as it examines individual’s experiences, feelings, notions and behaviours. 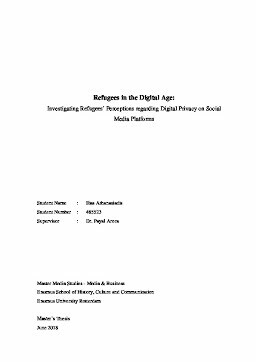 The thematic analysis revealed five themes which explain refugees’ digital behaviour and perceptions regarding privacy: (1) the use of digital technologies, (2) refugees’ perceptions of integration, (3) datafication, (4) digital privacy and trust, and (5) privacy management and protection. These themes depict the way refugees use new technologies in their everyday life and how it has been influenced by the various privacy protection strategies that individuals have adapted in order to protect their privacy. Furthermore, this thesis provides a critical evaluation of its limitations and offers few suggestions for further research in order to gain a better understanding of the issue.